In today’s modern, high performance systems, control of contamination is critical. But without analysing the condition of the oil in the system, there’s no way of telling just how ‘clean’ or ‘dirty’ the oil is. Therefore, oil analysis should be performed on a regular basis to monitor contamination levels. Oil sampling and analysis can also give early warning indications of impending component failure. The contamination level is measured by counting the number of particles of a certain dimension per unit of volume of the fluid; this number is then classified in Contamination Classes, according to international standards. Measuring is made with Automatic Particle Counters that can make the analysis on line (through sampling connectors put on the system for this purpose) or from sampling bottles. The calculations and sampling of the fluid must be done according to the specific ISO norms, to attest their validity. 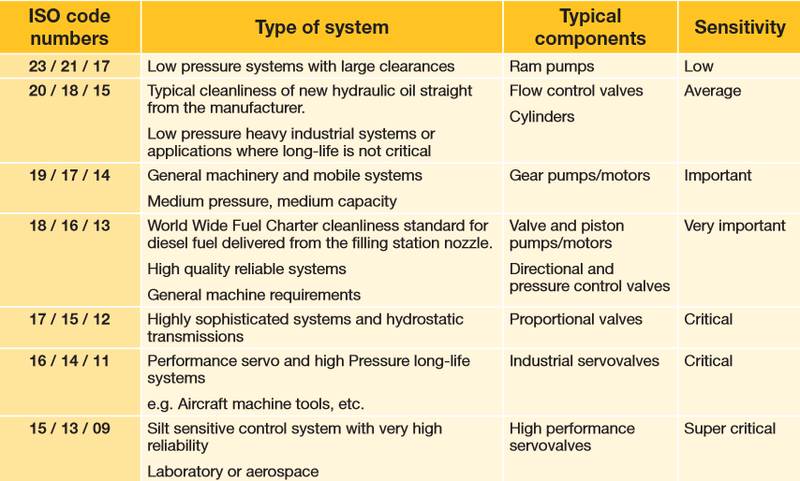 The most popular standard for Contamination Classes in the hydraulic systems is ISO 4406:1999; the standard NAS 1638 (under revision) is also quite used. The Contamination Class according to this standard is described by 3 numbers indicating the number of particles per 100 ml of fluid having bigger size than 4, 6 e 14 ?m(c) respectively. If you’d like to talk to us about oil sampling and analysis, please complete the enquiry form and we’ll call you back. Alternatively, send us an email and we’ll get right back to you. If you have any questions about our products or would like to arrange a free site survey then please get in touch.